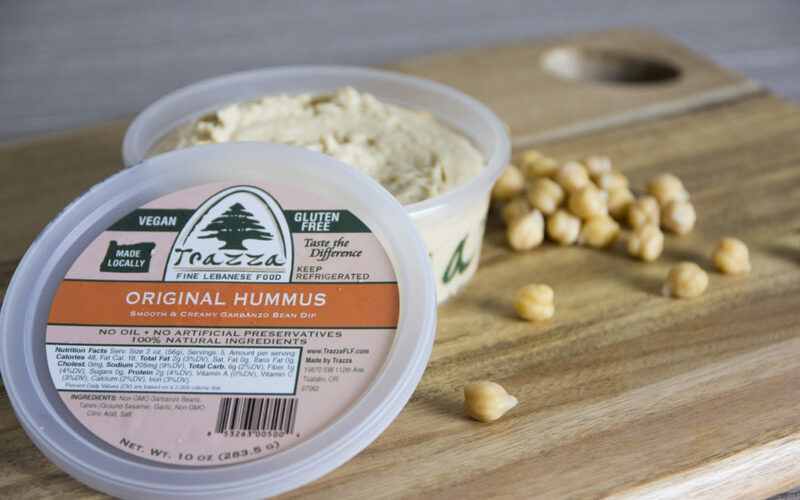 Our original hummus offers the perfect balance of natural flavor and smooth texture. An authentic classic hummus you can feel good about eating with a taste that never grows old! Calories 48, Fat Cal. 18, Total Fat 2g (3%DV), Sat. Fat 0g, Trans Fat 0g, Cholest. 0mg, Sodium 205mg (9%DV), Total Carb. 6g (2%DV), Fiber 1g (4%DV), Sugars 0g, Protein 2g (4%DV), Vitamin A (0%DV), Vitamin C (3%DV), Calcium (2%DV), Iron (3%DV). Stop by for free samples of Trazza flavors today and taste the difference for yourself! Stay informed! Sign up for our email newsletter! Thank you for bringing hummus samples to Natural Grocer (Salem) a couple of days ago! This is the best hummus I have ever had! I bought the "Cilantro & Jalapeno" Hummus-the flavor is exceptional. Be assured that I will purchase more varieties of your hummus in due time. My husband and I are addicted to Trazza Hummus. We're pretty picky when it comes to flavor and authenticity of hummus and we think yours is the best! The only issue is that we think that the tubs are too small. For us, there's about one to two servings per tub. Just want to say how much I LOVE your Tabouleh. It's the best in town! Please keep it coming to Food Front. Cilantro and jalapeño won my taste test. I will be a repeat customer. Yum! No expiration worries at my house. This will be gone the same day it is opened. Just tried your hummus today, purchased from Whole Foods at Hollywood store. Love it! Taste is great and I am so happy you don't put icky canola oil in your hummus. I'll be a repeat customer for sure. Tried the garlic and chive, yummers. Cilantro jalapeño is good too! Only 5 ingredients and it's so tasty! I don't know what "hummus" I was eating before but THIS is good hummus! My almost 2 year old loves it too! We're actually snacking on it right now! Looking forward to trying the other kinds! A friend recommended your hummus at Chuck's produce in Vancouver when we had lunch together there last week...it was so good! delicious ...one of the best I have ever had! If not the best! Was introduced to the cilantro-jalapeno hummus over the weekend - yummy! My new all-time fave. Best falafel & baklava in town!!!!!! Totally addicted to Cilantro/Jalapeno hummus. Best ever, anywhere. Hands down!! My kids loved it too!! Hey! I tried your hummus and baba ghanoush on Saturday. IT WAS AWESOME! Thank you for the most incredible middle eastern food I have tasted outside of a 5 star buffet in Dubai. I have fallen in LOVE with your Mihshi. Your story is special faith, family, commitment to a dream, and fun. Putting God first in all you do shines. ©2018 Trazza Fine Lebanese Foods. All Rights Reserved.